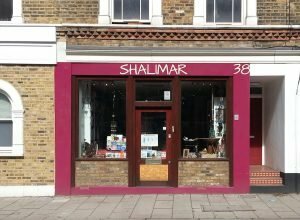 The ethos and vision behind Shalimar Books (formerly Soma Books) was always more far reaching than exclusively being an Indian book and craft specialist in London. It was Independent Publishing Company (IPCO) that started in the 1940s which published two anti-imperialist magazines – The African and Colonial World and The Indian at Home and Overseas. They were later to be amalgamated into one magazine called Asia & Africa Review. It also published books, such as Richard Pankhurst’s book on Kenya. It was IPCO, the company which my father Anand Kumria took over from his father, that started importing Indian books and became the first book business to specialise in this area, long before anyone else came on the scene. IPCO also started to import Indic language books in the late 60s to cater to the needs of the immigrant community of Indian descent. 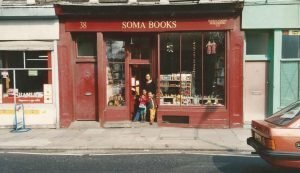 Considering the times in which Soma Books began (born in the 1980s when we were given the franchise to open a shop in the Commonwealth Institute), I see my parents as pioneers and visionaries for many of the kinds of aesthetics which became commonplace in museum shops and areas such as Covent Garden in the 90s, with particular reference to the fine art and handmade craft scene. It was my mother, Minnie Kumria, who laid the foundations for importing craft with her sister, Kamini Tankha, and her company Some Fine Things based in Delhi. 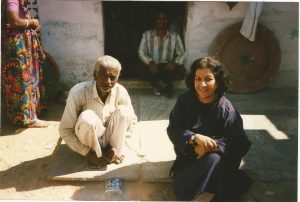 Over two decades they worked closely with craftmakers, tribespeople and women’s organisations in India. This helped to provide a livelihood for the families of the traditional craftmakers and in many cases introduced tribal craft to the western market for the first time. It was what real fair trade looked like in action. This was also a big part of Soma’s core values and I believe its enduring legacy. Through hard work and determination Soma Books established itself as a fixture at the Commonwealth Institute and realised the opportunity to represent India’s rich tradition of literature, fine art and craft to a western audience. The shop provided books and craft from the Commonwealth and on the Commonwealth to people living here in Britain and provided literature and histories of the Commonwealth countries. The other dimension to Soma and later Shalimar’s beginnings which I feel is worth mentioning is that both of my parents have been very politically active throughout their lives and this I feel is reflected in the wide range of areas that are covered by Shalimar today. These include history, politics, gender studies, sexuality, yoga and health, religion and philosophy and originally focusing on Africa, Asia and the Caribbean, Soma always maintained a connection to the community, supplying books to schools and libraries across the UK. This expanded to include imported titles from the US to meet the growing demand for books with positive representations of race for young readers. Soma was also involved in publishing intermittently, from Indian fiction to dual-language titles for kids. Shalimar has brought this element forward, most recently collaborating and working on Across the Black Waters, and stocking and distributing the books of a number of progressive, independent Indian publishing houses. 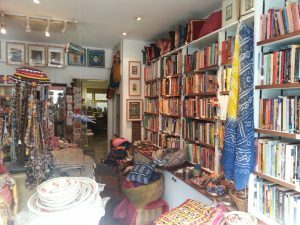 Today, when people enter Shalimar Books in South London (where the shop has been since 1973/4), they are met with vibrant colours, embroideries and textiles, fine artwork, vintage handmade craft and, of course, books, all of which reflect almost 40 years specialising in South Asia and the subcontinent. I think people appreciate the complementary nature of having the books sitting alongside handmade craft and art. What makes Soma unique, I believe, is its ability to provide real insight on traditions at a grass roots level. Where do these beautiful things come from? Who made them? What’s the story behind them? In this way, Soma and now Shalimar have never been only a book or gift shop. It’s really an experience in culture and aesthetics and a showroom for Indian art in its many, many forms.